Leaders from China and the U.S. mark signing ceremony on April 12, 2019 at 10:30 AM. 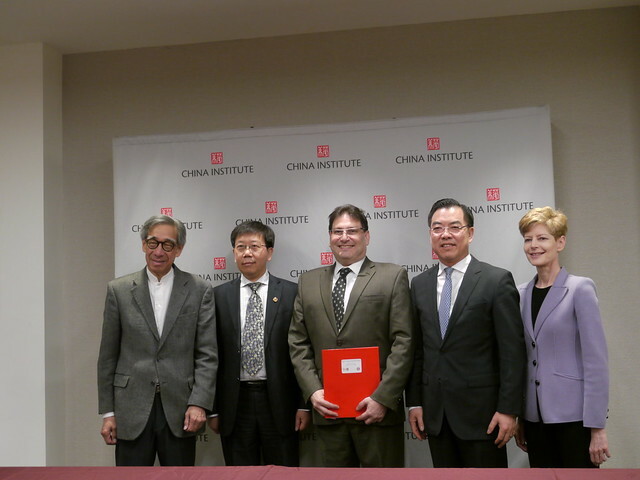 NEW YORK, April 3, 2019 – Expanding the partnership launched in 2006, China Institute and East China Normal University (ECNU) will join to inaugurate a new physical space at China Institute on 100 Washington Street that expands each organizations ability to deliver training and educational resources in New York City. What began as a K-12 educator training program for language teachers throughout New York City will soon become a suite of services that deliver on both China Institute and ECNU’s value for their constituency and mission to provide unique cross-cultural services and education. The ECNU Center at China Institute was enabled via a generous grant from ECNU and will be situated in spaces to be renovated on the second floor of our 100 Washington Street facility due to be open to the public in October 2019. The Center will become a hub of Chinese cultural education and a platform to strengthen academic and people-to-people exchanges between the U.S. and China. “China Institute (CI) and East China Normal University (ECNU) have been partners since 2006 when the first Confucius Institute in New York was established at China Institute. This signing ceremony marks a significant expansion in our capabilities and we look forward to opening the doors to the ECNU Center at China Institute as soon as we can to be of service to our valued community of educators and general public, as well as those dedicated to advancing cross-cultural understanding between the U.S. and China,” said James B. Heimowitz, President of China Institute. “East China Normal University is proud to partner with China Institute in inaugurating the ECNU Center at China Institute. Our training and resources will be of great use to U.S. educators and learners and we look forward to continuing to be a vital resource and service provider to promote greater engagement with Chinese language and culture by means of a remarkable plan of happiness and academic capacities,” remarked Xuhong Qian, President of East China Normal University. The inauguration of the space takes place on Friday, April 12 from 10:00 AM – 11:00 AM at our space on 100 Washington Street (enter at 40 Rector Street, 2nd floor). About China Institute China Institute advances a deeper understanding of China through programs in education, culture, art, and business. It is the go-to resource on China—from ancient art to today’s business landscape and its rapidly shifting culture. Founded in 1926 by Chinese reformers Hu Shi, K.P. Wen, and John Dewey, China Institute is the oldest bicultural, non-profit organization in America to focus exclusively on China. About East China Normal University East China Normal University is a comprehensive, national public research university in Shanghai. The University has 21 schools and colleges, and 5 advanced research institutes, with 58 departments offering 70 undergraduate programs in humanities, education, science, engineering, economics, management, philosophy, psychology, law, history and art. The university has established exchange and cooperative partnerships with more than 150 internationally renowned universities and academic institutions.